If you downloaded the self-installer, run it. Note that the self-installer version also installs an uninstall capability. To uninstall select Windows Taskbar | Start | Control Panel ► Add or Remove Programs... | scroll down to the TM Goal Seek entry. For installation instructions see common installation instructions. In Excel 2007 or later, load the TM Goal Seek (Ribbon UI) add-in. There is no support for Excel 2003 or an earlier version. Use the TM | Utilities group | Goal Seek button as in Figure 1. This will bring up the TM Goal Seek dialog box. It includes the same fields as the standard Goal Seek dialog box. Functionally, the two dialog boxes are the same but the TM Goal Seek box allows more flexibility. In Set Cell specify a cell with a formula whose value should reach a target value. In the to cell specify the target value or refer to a cell that contains the target value. This is different from the standard Goal Seek, which only allows a value in the field (i.e., no cell reference). 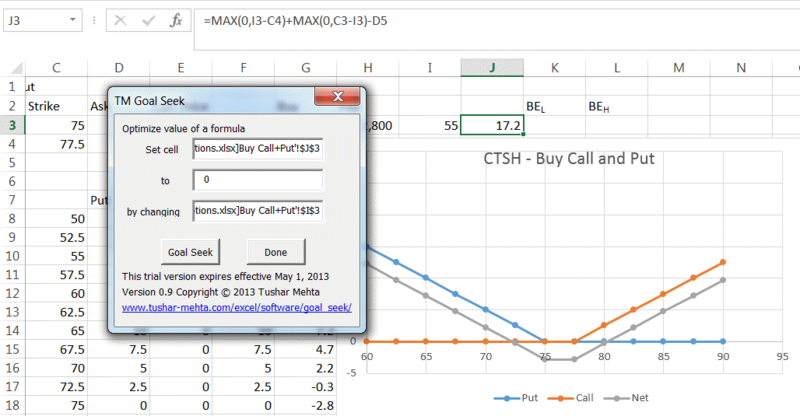 Finally, in by changing, specify a cell that the formula in Set Cell references. Goal Seek will adjust this cell until the value in Set Cell reaches the target value. For example, in figure Figure 2, the value of the formula in J3 should become zero by changing the value of I3. The target value (i.e., the 'to' field in the dialog box), can be a number or a reference to a cell that contains a reference. The TM Goal Seek dialog box can remain open while modifying the worksheet. Finally, closing and reopening the TM Goal Seek dialog box leaves the previous settings untouched unlike the standard dialog box, which resets all the fields.